Apparently, it is believed that Blogger does not support animated GIF images. This belief is correct to some extent. However, as you can see from this post "Wordless Wednesday: Height of Automation", you definitely can insert an animated GIF image into a Blogger post. The statement that 'Blogger does not support animated images' only means to say that the WYSIWYG editor of Blogger does not support such images. In other words, if you try to upload an animated GIF image in your blog post though Blogger's Post Editor, the GIF file is converted automatically into a static PNG file during the upload process. So how does one add an animated GIF into a Blogger post? Very simple really. Just login directly into your Picasa Web Albums. All images added to posts on Blogger are actually stored on Picasa Web Albums, in a folder carrying the name of your blog. Use the "Upload" button there to directly upload your animated GIF file to the album for your blog. When you see the newly uploaded image in the thumbnail list, just click on it. It displays the image in its actual size. Right click on this image, and then click on "Properties" (right at the bottom). It displays a small "Element Properties" box. Copy the value mentioned against "Location" in this box. This value is the actual URL of your image. 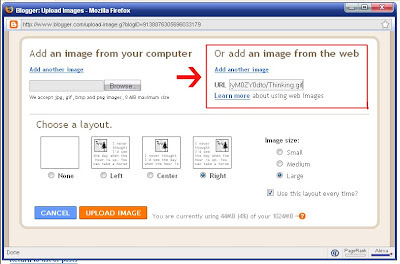 Come back to Blogger's Post Editor, and click on the "Add Image" button on the Toolbar. 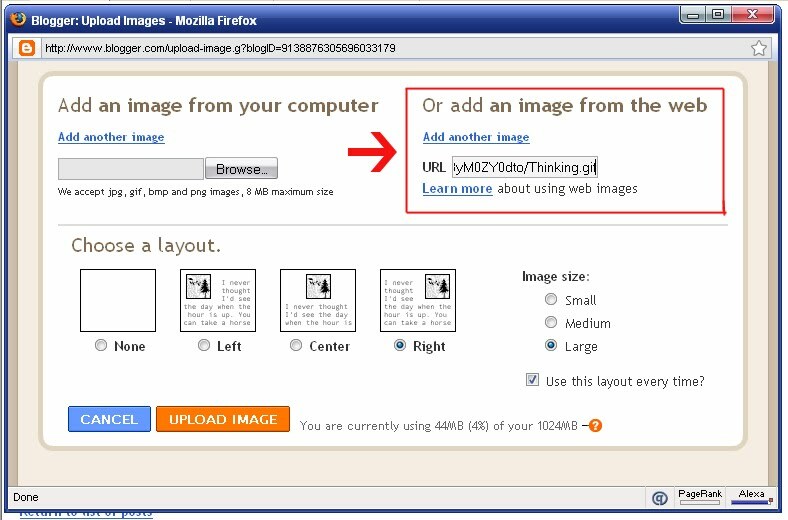 In the "Blogger: Upload Images" box, enter this copied URL in the "Add an image from the web" box, on the right side. Refer to the screenshot below. That's it. You will see the animated GIF image in your Blogger Post Editor now. Mine shows this black cat, deep in thought, strolling across the width of the 'Compose' box. I was looking for the same. this post solved my question.